Located above the north doorway. 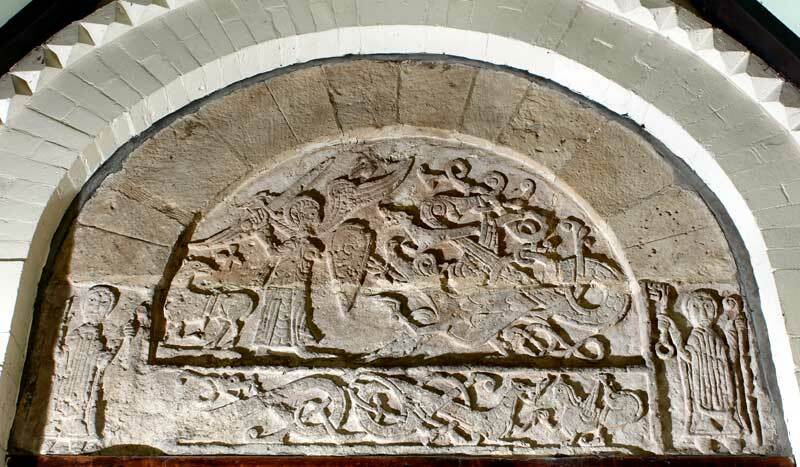 The tympanum is of round-headed, stilted form with lugs to left and right bearing standing figures. Above the standing figures is an arch of plain voussoirs. The tympanum was originally monolithic but has a horizontal break at the level of the tops of the lugs. The principal central panel depicts St Michael on the left, armed with a shield and sword, fighting a dragon to his right. The tail of the dragon forms a number of interlocking scrolls, one of which terminates in a chimera-like creature which also faces St Michael. Behind the saint is an Agnus Dei with its head turned toward the scene of combat. Below the central field a rectangular panel runs the width of the central composition. On the right, facing left, is a harpy confronting a dragon. Each has a foreleg upraised and their claws are touching. The left side of the panel (damaged) is carved with a dragon, its body facing left, but its head turned to the right. Its tail forms an elaborate scroll which fills the left side of the panel and merges with the tail of the dragon that confronts the harpy. On each projecting lug is a standing saint. On the right is St Peter, holding a key in his raised right hand and a pastoral staff in his left. On the left is a figure identified by local tradition as St Paulinus of York, with his right hand raised in benediction and something, possibly a bird, in his left hand. The pulpit is located in the south-east corner of the nave in front of the chancel arch. It is octagonal in shape with one section left open to form the entrance. Access is via four stone steps covered with green carpet. The entire font is constructed of stained deal, with each of the seven sections pieced with two narrow lancet shaped panels with squared apex’s. Three half shafts moulded bases and capitals form the sides of the lancets. 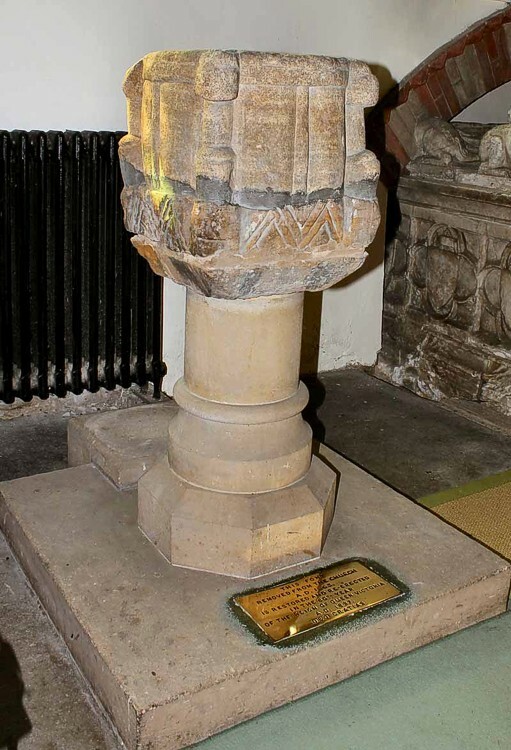 A small pierced roundel sits level with the flat top edge of the arch over each spine. Diagonal tongue and groove boards fill the back of each panel. Over the top of the panels is a pediment decorated with three pierced eight petal flowers. A small reading stand rises from the front of section. Below the pulpit eight tapering sections of tongue and groove boarding cover pulpits the main support. 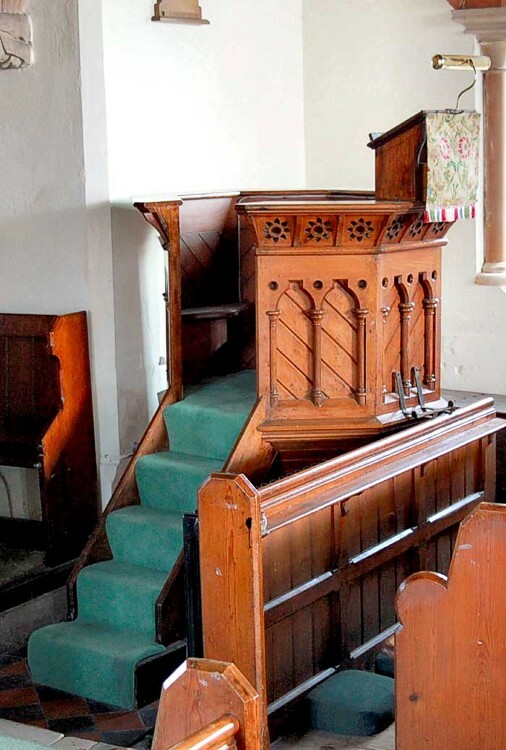 Further support has been added by the addition of an iron bracket secured to the lower front section of the pulpit and the top of the book rest of the front pew. 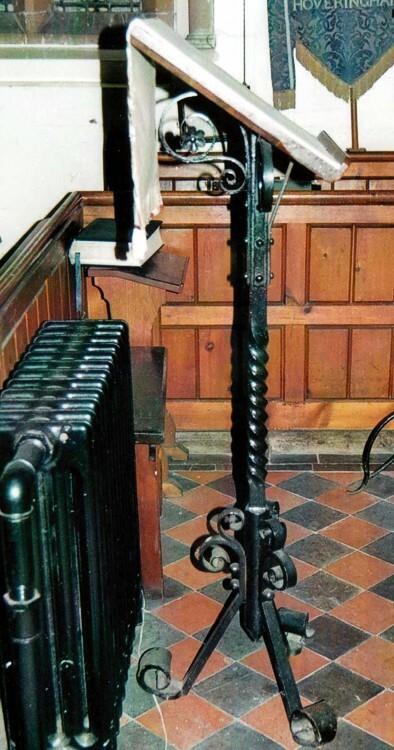 On the north side of the nave just close to the chancel arch is a black wrought iron lectern. It rests on a scrolled tripod base supporting a twist turned spine terminating in three lighter scrolled brackets which carry the wooden reading platform. All the pews are made of stained pine. Their design is functional, traditional and plain. The ends of the pews are undecorated, all have chamfered edges and a rounded arm on the front edge. 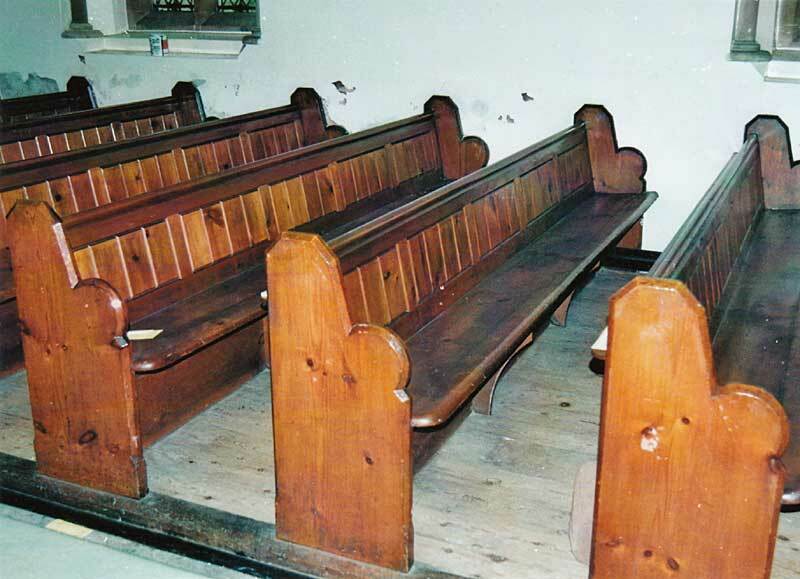 The back rest of the pews are panelled with tongue and groove boarding between the top rail and the seat rail, book rest for the pew behind is also fixed to the top rail. In number there are fourteen pews on the north side of the nave each seating six or seven people. 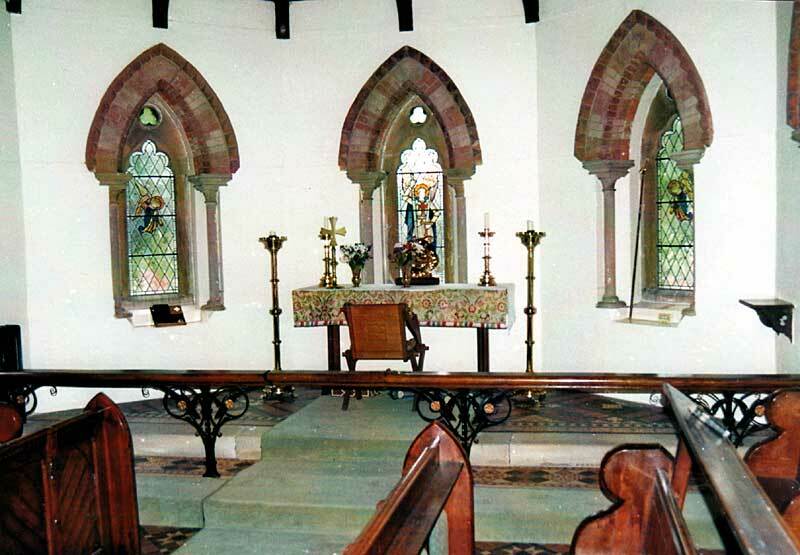 On the south side there are thirteen remaining pews, some having been removed, one has been reversed to face west and forms the children’s corner. In the north east corner of the nave facing the pulpit there is another pew accommodating three worshipers. On the north side of the chancel there is a single choir stall, with two stalls on the south side. The front of the choir stalls on both sides are identical. Made of stained pine they each have lancet pointed ends with a cross carved on the east ends. 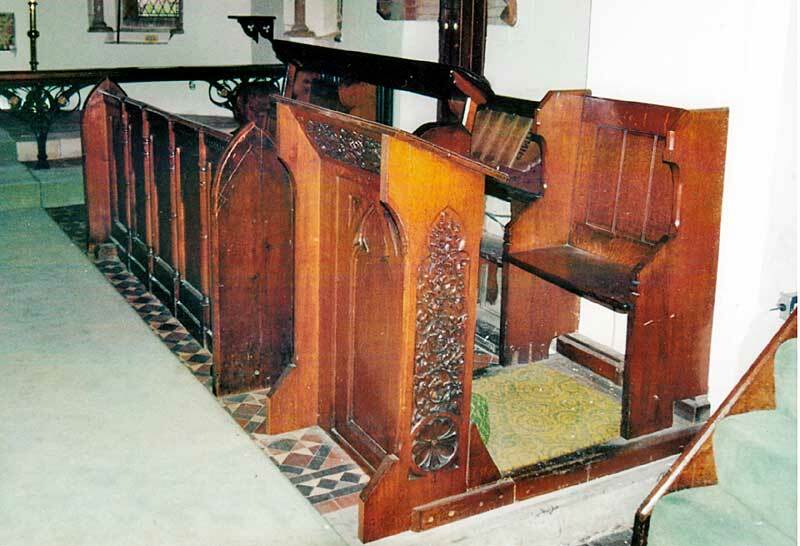 Both have panelled fronts, whilst the rear pew on the south side has a raised book-rest. The front of the stalls have pointed arch panels in-filled with diagonal tongue and groove boarding. A two seat pew without book-rest is located on the south side of the chancel between the vestry door and the sanctuary step. The altar has a framed wood top with a rectangular central support at each end resting on a bridge base, all finished with stain. Over the first step of the sanctuary is a stained, moulded wood communion rail resting on four decorative wrought iron cantilevered supports. The iron is painted black with two gilded rosettes standard. 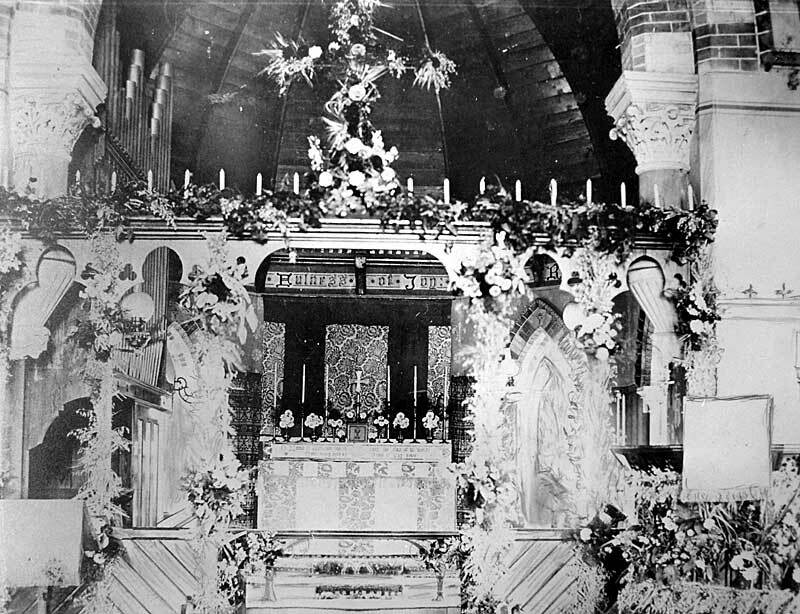 In front of the altar is an x-legged oak chair with curved arms. It has a leather seat and back panel. Set under the south side of the chancel arch is the priest seat with attached book-rest. The seat is stained wood with the panel back boarded. The book-rest is more ornate having foliaged carved side panels with trefoil heads and the underside of the inclined rest also supporting the same style carving, whilst the front panel of the desk is trefoil headed. All the wood work is finished with stain. 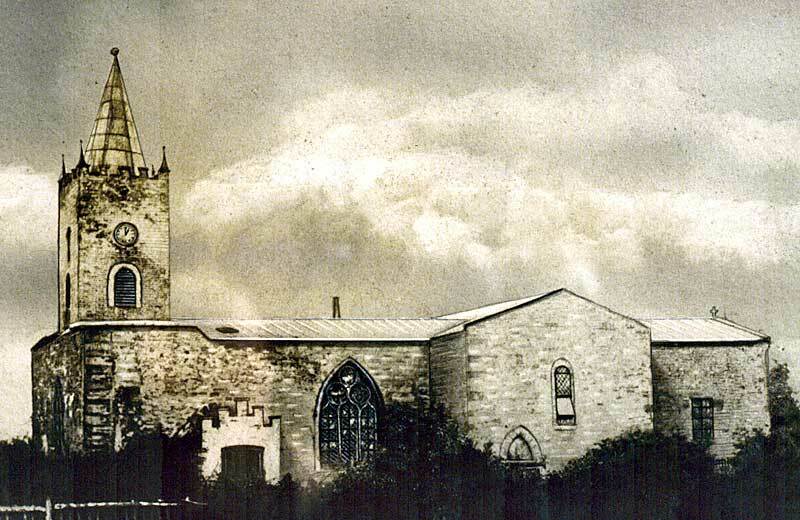 Two old framed black and white photographs of the former church are on display on the wooden wall of the store area in the south-west corner. A plain oak table with a drawer and two brass handles. Also six spindle back chairs. A large oak undecorated parish chest.